SNK Playmore made a great surprise to all KOF fans: a shoot'em up taking place in the universe of the famous series of fighting games. This shoot seems to feature a very classical gameplay: 3 action buttons (A button for normal attacks, the B button for a special attack when the gauge is filled and the C button for another special attack). 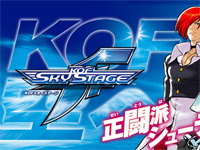 The characters in the game are Kyo, Athena, Iori, Kula, Mai and Terry. KOF Sky Stage will be released in late January in Japan (reservations begin December 12) and will cost 168,000 Yen (1260 €). 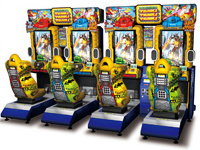 Brent Sales, the UK subsidiary of Namco Europe will unveil five brand new titles for 2010 at Preview exhibition in october. The starring game will be Bandai Namco Games's Tank! Tank! Tank!, a simulation tank battle game with pneumatic moving seats. The cabinet is very visible with its flashy design and its vertical screen, furthermore up to eight units are linkable. Other debuts titles are two new releases from redemption specialist ICE: Go Ball-istic (featuring 5 fun family themes played on a touch screen) and Photo Finish Racing (a ball rolling horse racing game). A new prize vending game will be presented: Marksman (player must aiming a plunger to penetrate a target to win a prize). The last new release is Chicago Gaming Company's PUTT! Championship Edition, a ticket redemption golf game that uses a real putter and ball. 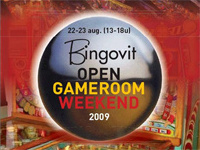 This weekend, many pinball lovers will attend the Bingovit open days. All pinballs will be set on free play including current and older Stern tables and pinballs from other manufacturers. Between two pinball games, attenders can try Bally bingos (50 different models), darts and Photoplay. Collectors will be pleased since second hand machines will be sold. Furthermore, Carl Jacobs (privategameroom.be) will be present the whole weekend with spare parts for bingos and pinballs. Visitors will have the chance to taste the delicious Zonderik beer with an ice cream! Bingovit will open its doors between 13 and 18 o'clock these 22nd and 23rd of August at 29 Eigenlostraat, Sint-Niklaas. It was with a great satisfaction that Insert Coin organizers have closed the doors on 19 July. The audience didn't miss the rendez-vous and could try a lot of games. The tournaments were a huge success and the exhibitors came away satisfied by the two-day show. This first edition proved that there was a demand for a show aimed at an audience of passionates. Meet you there next year to verify if the organizers successfully score a second try! In the meantime, you can relive the highlights of the show by browsing our photo report. 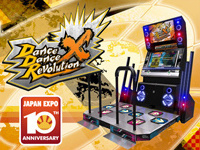 Konami launched Dance Dance Revolution X at the Japan Expo event in Paris from 2nd to 5th of July. Konami had a large stand with a myriad of Konami products including the phenomenon Yu-Gi-Oh! Trading Card Game and of course DDR X which proudly stood on the booth central stage. Many events were planned as the visit of BENAMI Productions' Naoki Maeda who composed a vast amount of tracks featured in DDR X and other BENAMI music games. The highlight of the event was the DDR X tournament where players from all over France competed for the champion title. A 20 minute special feature about the event will be broadcast on MTV show "Game One". Dance Dance Revolution brand (formerly named Dancing Stage in Europe) celebrates its 10th anniversary this year. So after a successful test period, Konami and Electrocoin proudly announced that the new hit product will be shipped throughout Europe within coming weeks. 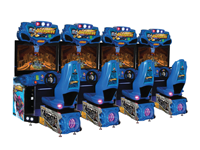 The first noticeable difference with DDR X, in comparison to previous models, is the makeover the cabinet has received: decorated in eye-catching decals and featuring a 37" wide LCD screen. The software itself has been refined, with many new music tracks bumping the total number of songs to almost 400! There are also other features bound to keep players interest which will be announced over the coming months. Here comes summer and the summer sales! 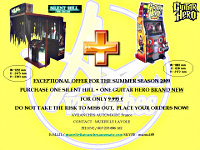 Surprise comes from Avranches Automatic (France) which offers a bundle including Silent Hill - The Arcade and Guitar Hero Arcade for €9 995 only! In other words; two machines for the price of one! And not the least: Last year's Silent Hill is a well-known and excellent deluxe light gun shooter set in an intense horrific atmosphere. While Guitar Hero is a musical game very popular among home players who will take their chance at showing off their skills in public on this brand new arcade version! Save a surface of 130 x 248 cm for Silent Hill and 101 x 84 cm for Guitar Hero. Two new great games at this price, you don't see an offer like this everyday! You can place your order by phone (0033 233 896 162) or by filling up the website contact form. Hurry up, stock won't last long! 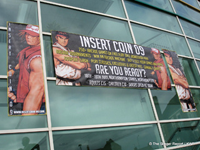 We're only a few days ahead the Insert Coin 2009 show which will take place in Northampton (UK). 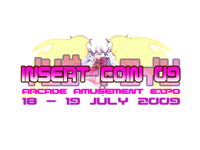 Insert Coin will be Europe's biggest amusement show open to players. Organizers expect no less than 7000 visitors over the two days exhibition (18 to 19 July). The show will be divided into 3 areas: "Tournaments", "Exhibition and stands" and "Entertainment". Tournaments will be held during the two days with competitions on classics but also new titles such as Street Fighter IV and Tekken 6 - Bloodline Rebellion. Guinness World Records will be present to officialize new records which will appear in the Guinness World Records Gamer's Edition! Contestants will receive prizes. Major amusement scene actors will be present, visitors will able to buy collector items, spare parts, merchandising and especially hardware and software hardly found outside Japan. Entertainment area will allow visitors to enjoy lots of events related to video games. The most anticipated show is certainly the Cosplay competition. For those who have purchased VIP tickets, an "After Party" is scheduled during the first day evening with sixty special guests, refreshments, the awards ceremony of the day tournaments and a amusement based question & answer session. The atmosphere will be granted by a DJ session! Ticket prices is £10 for children, £15 for adults and £23 for both days. More details on the website. Holidays are coming, it's time to plunge into H2Overdrive's frenzy. Raw Thrills's new title whose prototype was unveiled at ATEI is now available. The final version of the machine features a 42" hi-res LCD screen and is equipped with force-feedback steering and a powerful seat subwoofer. Player selects from 9 boats to navigate on 7 water courses including canyon rapids, jungle swamp and flooded city streets. These courses are full of secret passages, obstacles, jumps, boosts and super boosts to pick up to improve boat's performance. H2Overdrive is linkable up to 8 and each machine features an interface to save profile and accomplishments through a PIN code. This title is distributed by Namco Europe. Good news for arcade fans revealed at E3! Konami has announced the worldwide release of an arcade version of its console hit: Metal Gear whose title is simply Metal Gear Arcade. 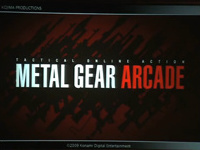 It's Hideo Kojima, creator of the series, who introduced the new title at a press conference where pictures presenting the title were shown. This game will be a tactical online action game. The player will wear special goggles to experience the game in 3D! It's now good habit for Konami to adapt its console games to arcade, remember very successful Silent Hill and Castlevania games! You can watch the press conference on youtube. French magazine Player Two is back! After two years of silence, an editorial team reformed to create the fourth number of this fanzine mainly targeted at the nostalgics of the 16-bit era. True to the original spirit, this new issue offers (not without a good sense of humor) many arcade, console and computer game reviews as well as special features like how to add a 50/60Hz switch to a Master System and the best way to play video games in the toilet as well as ads of that time thrown here and there. Regarding arcade games, the following titles are reviewed: Magical Drop III, Progear no Arashi, Rad Mobile, Street Fighter II, Garou - Mark of the Wolves, King of the Monsters 2 and Mutation Nation. A music compilation with featured games themes is available as a separate download. The magazine in PDF format is 75Mb in size while the accompanying MP3 tracks weight a good 65Mb, you can download both files at Player Two website.